Be the first to hear about their new releases and deals. Download the Booksprout app and search for Anita Merrick today! As a Mystical Author, Anita Merrick is a 3rd generation psychic, retired and living in a wooded area of Erin, NY with her husband, Timothy, and furry children—two West Highland White Terriers and a half-Westie/Cavalier King Charles spaniel. As Crystal Wind (DBA), she is a Psychic Intuitive, Tarot Reader and Medium, an ordained priestess in the Order of Melchizedek. 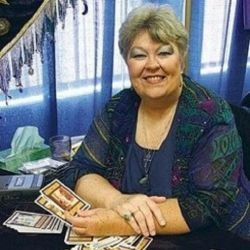 She holds certification as a Tarot Master from the Tarot Certification Board of America. Prior to 1991, she performed as Nehebka, a semi-professional Oriental (belly) dancer; at the same time raised, trained and showed Appaloosa horses. A Bitter Wind, a first novel, comes from a life-long love of Egypt that probably really began in 1988 as a belly dancer and a first trip to Egypt and a performance at the Winter Palace of Luxor. Starting about 1991, her focus went to the paranormal, supernatural and metaphysical, as well as the tarot. That led to the next trip to Egypt (1997) with a group of like-minded friends then a synchronistic connection with Nicky Scully/Shamanic Journeys, Mary K. Greer and Normandi Ellis, Anita returned to deepen an understanding of the mystical. The last trip in 2011 (Shamanic Journeys) most powerfully connected her to the mysteries of Egypt—Like a portal opened into the ancient past, the spirits spoke and their stories became this book.